Peace Education Journal, Vol. 18, Feb. 2019 is dedicated to An Apostle of Peace Dr. Young Seek Choue in his perpetual memory. Choueology as Peace Education is based on the editorial written by the author of these lines Dr. Surya Nath Prasad for this Special issue of Peace Education Journal. Authors whose articles are included in this issue of the Journal are Dr. Young Seek Choue (Oughtopian Peace Model: A Design for Permanent World Peace), Surya Nath Prasad (Dr. Young Seek Choue: A Genuine Nominee for Nobel Peace Prize), Javier Perez de Cuellar (Dr. Young Seek Choue, Peace Pilgrim), Boutros Boutros-Ghali (Chancellor Choue and the United Nations), Rodrigo Carazo Odio (Oughtopia, Education and Peace), Suman Shukla (Dr. Choue’s Oughtopia: A Peace Dream to A Peace Reality), Surya Nath Prasad (Utopia/Oughtopia, Education And Peace), Christoph Wulf (Culture of Peace and Education for Peace), Surya Nath Prasad (Essential Requirement of Qualities in the Rulers and Servants of People for Good Governance: The Role of Universal Peace Education), Surya Nath Prasad (Global Man as the Vision for the Third Millennium: The Role of Peace Education), Surya Nath Prasad (Restructuring Education Based on Spiritual Secularism for Kindness, Tolerance and Nonviolence), IAEWP (Principles and Objectives of International Association of Educators for World Peace), and Peace Education (About the Editors). Dr. Young Seek Coue is an idea of peace. He is the concept of peace studies (Irenology). He denotes the term peace education. He symbolizes with his plan through UN Pax. He is the name of equality, liberty and co-prosperity based on his original idea of universal democracy. Dr. Choue is the originator, hence he is the father of the word Oughtopia – a new model of an ideal realizable society – a Global Common Society of spiritually beautiful, materially affluent and humanly rewarding, which all men and women should strived to achieve as he has advised. 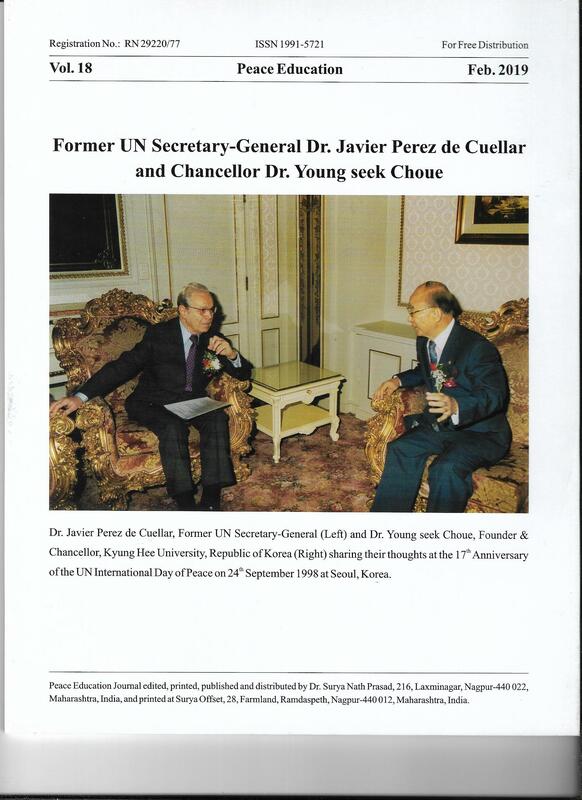 The name of Dr. Young Seek Choue, a world-renowned Korean peace thinker will be written in golden letters in the world history and development of peace. Dr. Choue has contributed a lot of knowledge, study and practice towards peace. Therefore, I developed the term ‘Choueology’ for his whole ideas and concepts of peace. In my view, Choueology, in true sense, is peace education, which covers all the three areas of peace knowledge, skill and practice. Choueology is the science or study of peace ideas, peace studies (Irenology) and peace activities. Dr. Choue’s peace education provides learners the knowledge to preserve/maintain/sustain peace; to prevent from war and violence, and to remedy the effects of war and violence. Dr. Choue developed several concepts for peace as his ideas, thoughts, proposals, plans, hopes, vision, wish, efforts, opinion, dreams, design, action and other similar programmers. Here I would like to cite some of Dr. Choue’s wonderful publications which enlighten to all about his peace ideas contained in them, viz. Democratic Freedom (1948), Creation of New Civilized World (1951), Man and Creation (1960), World Peace Through Education (1971), Toward the Brighter Future (1974), Reconstruction of the Human Society (1975), Will to Create (1996), Oughtopia (1979), World Peace: The Great Imperative (1981), Peace Studies (1984), World Peace Through Pax United Nations (1984), Proposals for Peace (1986), Text Book on World Citizenship (1986), World Encyclopedia of Peace (1986), Peace in the Global Village (1987), A Grand Design for World Peace (1989), White Paper on World Peace – Chouean Irenology (1991), Why and By What Method Should Human Society Be Reconstructed (1993), World Encyclopedia of Peace (1999), Magna Carta of Global Common Society (1999), Will World Peace Be Achievable in the 21st Century? (2000), Global Governance in the 21st Century (2001), Toward A Global Common Society Through Dialogue Among Civilizations (2002), Some of his peace lyrics are: Let’s Live Together Looking Ahead (1964), Songs for the GCS Movement (1975), Songs for Peace (1981), Peace the Only and Best Way for Us to Live With (1985), Becoming One (1997), Open the New Millennium (1999), Let’s Illuminate the 21st Century (2000), Neo-Renaissance Hymn (2000). Dr. Choue has contributed a lot in the field of peace studies also. He established Kyung Hee University 1955 , Institute of Brighter Society , 1975, Centre for the Reconstruction of Humanity 1976 , Institute of International Peace Studies 1979 , Kyung Hee Graduate Institute of Peace Studies 1984 , Oughtopian Peace Foundation 1989 , Graduate School of NGOs 1998 , Kyung Hee Cyber University 2000 , New Millennium Peace Tower 2001 , and several other academic institutions to enable future generation to learn about and for peace, to be trained in peace and to build peace. The Graduate Institute of Peace Studies founded by Dr. Choue in 1984 with the purpose to educate and foster able and peace-oriented international leaders for the future of mankind, providing full scholarship covering tuition fees living expenses and necessary books for two and half academic years, and the UNESCO awarded its Prize for Peace Education to his institution in 1993. Dr. Choue initiated a variety of peace activities, peace campaigns and peace movements to improve in better living for all. He has done relief works for the needy, aggrieved, and victims of war and calamities for the last many yeas to make them peaceful. Medical treatment for atomic bomb victims of Hiroshima and Nagasaki was provided by Dr. Young Seek Choue, which was continued several years. A campaign for supporting Filipino flood victims was initiated by Dr. Choue in 1971 by donating relief goods. He sent free medical team to Bangkok, Thailand in 1982. Dr. Choue sent free medical team to Medan, Indonesia in 1983. A campaign for supporting the United Nations’ peace activities was initiated by Dr. Choue in 1986, and Fund raised US $ 44,978 was donated to the UN Trust Fund. Dr. Choue supported Chernobyl victim children and starving Somalian children in Africa through a campaign initiated by him in 1991 by holding two Charity Concerts: Grand Concert Peace Cantata and Grand Artistic Festival in Seoul, Korea with joint efforts of the UNICEF, and he donated 55,214,823 Won in Korean Currency, the profit from the Concerts, to the UNICEF, Seoul, Korea. In the same year of 1991, Dr. Choue sent the third dispatch of his University’s Free Medical Team to Sudan, Africa. Chernobyl Charity Exhibition (with 100 Russian Oil Paintings) was initiated by him in 1992 for Nuclear Plant Victims in Seoul, Korea, a n d profit US $ 77,826,46 from the exhibition was donated by him to those needed children in Kiev, Ukraine through the UN, Seoul, Korea. In 1996, he sent the relief goods, over 20,000,000 Won’s worth of powder milk through Korea Red Cross Society to help the flood victims of North Korea. In 1997, Dr. Choue donated the prize money 10 million Won in Korean currency of the ManHae Peace Award for the relief work for the poor Korean residing in Northeast Chinas through Dong – A Daily Newspaper. The 6th time Kyung Hee University free medical team was sent by him to Sakhalin, Russia in 1997. In the same year of 1997, he supported the flood victims of North Korea by sending relief goods over 140 million Won’s worth of goods through the Korean Red Cross Society. In 1999, Dr. Choue dispatched Kyung Hee University’s Free Medical Service Team to Alma-Ata, Republic of Kazakhstan+, C.I.S. (7th time, it usually cost about US $ 200,000 to dispatch the Free Medical Team each time). In 2000, he sent relief goods (2,317 boxes of clothes and shoes) for the cyclone victims of India through the GCS Indian National Chapter. Besides his relief works for victims of different times, Dr. Choue initiated 17 national and international peace campaigns, and peace movements. He initiated Better Living Movement in 1964 for Korean Government NEW Village Movement, The Asian Association of Model Villages – Better Living Movement (Osaka, Japan) in 1975, Brighter Society Movement also in 1973, the Global Cooperation Society Movement in 1978 (and under the spirit of this Movement Healthy Society Movement , Life Improvement Movement, Environment Protection Movement, Restoration of Humanity Movement and World Peace Movement were conducted by Dr. Young Seek Choue). World Peace Movement through the UN in 1981, Movement for the Reunion of Separated Families in Korea in 1982, A Movement for the Strengthening of UN by Developing a Pax UN Theory in 1984, Second Red Cross Movement Through Humanization of War in 1985, National Reconciliation Movement in 1988, Social Peace Movement for Restoring Morality and Humanity for Commemorating 50th Anniversary of the UN in 1995, Neo-Renaissance Movement for Restructuring Human Society in 1996, and thus 156 national and international peace activities from 1960 to 2001 were performed by Dr. Choue. In addition to these peace activities, Dr. Choue organized 23 International Peace Conferences since 1982 on the different themes of peace on the eve of UN International Day of Peace at Seoul, Republic of Korea. with exception of one which was organized by him in Philippines in 2003. 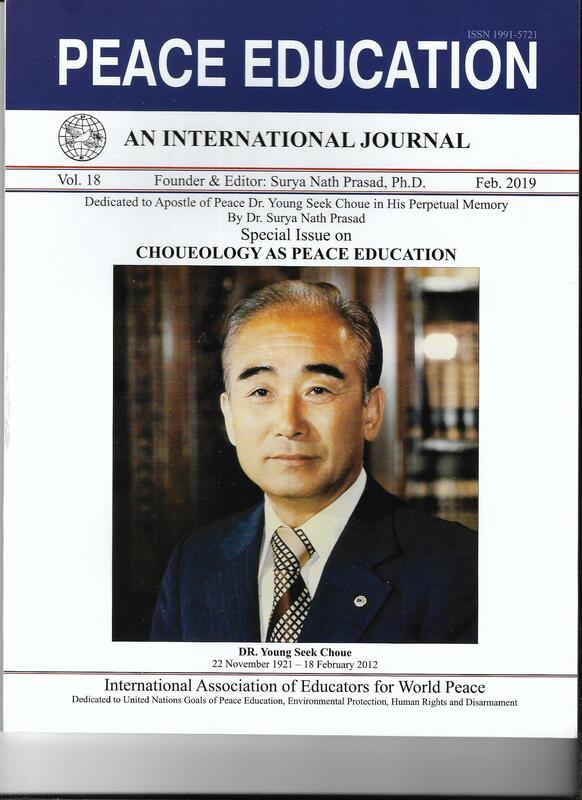 Considering the vast contributions of Dr. Young Seek Choue, in the areas of peace ideas, peace studies and peace activities I would like to term them as Choueology that is synonym of Peace Education. Anticopyright: Editorials and articles originated on TMS may be freely reprinted, disseminated, translated and used as background material, provided an acknowledgement and link to the source, TMS: Choueology as Peace Education, is included. Thank you. given the extensive credits for the ideation of Peace I find it strange that you did not mention his book onhow it took 7 years of his tme to achieve United Nations World Peace Day.. and i would like to add to his credits support for my world peace concepts presented and endorsed by Federico Mayor Zarragozza Foundation for a Culture of Peace. choueology is a mouthful to say peace, but it certainly deserves some songs to express choueology other ways than in our english language. peace and choueology needs some creative links as Dr Chour taught us with oughtopia. page 1 para 4 under the caption Dr. Choue’s Peace Ideas. celebrated everywhere in the third week of September every year. (Mr.
Mitch may refer to page 9 of the Peace Education Journal, Vol. 18, Feb.
the renowned persons of the world. ideas and practices of peace. concepts which they developed and lived and living with them. to justice for giving birth to peace. locked treasure of justice and peace within .